"The 59th Session was especially important given that we now stand on the threshold of UNGASS 2016, which is to be held in New York next month," said UNODC Executive Director, Yury Fedotov, in his closing remarks. "I warmly welcome the agreement on the outcome document to be adopted at UNGASS 2016 in New York in April. The document can now be used to forge the action needed to assist millions of women, children, and men around the world." UNODC Executive Director, Yury Fedotov, commended civil society organizations (CSOs) for their global activities, including their invaluable field work. "UNODC works with over 500 non-governmental and civil society organizations at the local, national, regional and global levels. Together, we have helped increase access to evidence and rights based treatment and care in over 40 countries," said Mr. Fedotov in his opening statement. special session. UNODC presented a socio-economic analysis of the latest Opium Survey in Afghanistan, which revealed that opium poppy farmers gained considerably less in 2015 compared to the previous year. 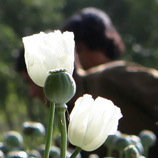 Figures in the analysis show that the gross income from opium decreased to $3100 per hectare in 2015 - 18 per cent less than the 2014 value of $3800 - and the lowest level since 2002, shortly after the end of the Taliban opium ban. 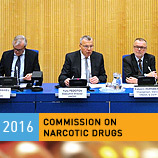 Alternatives to conviction or punishment, where appropriate, can be pursued by countries under the international drug control conventions, the head of UNODC, Yury Fedotov, stressed today at a side event on the margins of the 59th session of the Commission on Narcotic Drugs (CND).The discussions ahead of the UN General Assembly Special Session (UNGASS 2016), to be held in April. 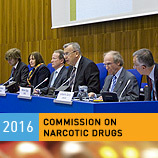 At 59th CND Session, UNODC Chief says UNGASS 2016 is about "putting people first"
UNODC Executive Director Yury Fedotov said the CND's work, including preparations for the UN General Assembly Special Session on the World Drug Problem (UNGASS 2016), to be held in April this year, was promoting a comprehensive understanding of the world drug problem and the need to put people first. Crucially, the UNGASS 2016 process has focused on lives lost and the needless suffering caused by illicit drugs. 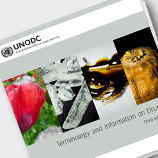 UNODC have published its newly updated third edition of the manual 'Terminology and Information on Drugs' . 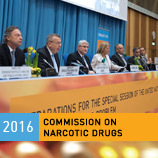 This edition of the publication - the first revision since 2003 - offers a much needed and timely resource, given the evolution and changes in drug markets in recent years.The content of the manual reflects the need to provide accurate and evidence-based information on the range of substances of abuse; from plant-based drugs such as cocaine and heroin. UNODC Executive Director, Yury Fedotov, stated, "the Joint Action Plan provides a welcome framework for UNODC and the OSCE to leverage their respective strengths." The new plan, he said, has been successfully expanded from seven to eight key areas and now includes police development and reform. He then acknowledged the importance of counter-terrorism cooperation. UNODC's Executive Director, Yury Fedotov, met today with the Permanent Representative of Japan to the United Nations in Vienna, Ambassador Mitsuru Kitano, to sign a new funding agreement worth some $16 million. The agreement is aimed at delivering several projects in various regions of the world to tackle illicit drugs and bolster preventing terrorism as highlighted in the Doha Declaration. The third annual World Wildlife Day (WWD) was held to raise awareness about the devastating impact of wildlife crime, UNODC, the World Bank, the World CustomsINTERPOL and the Convention on International Trade in Endangered Species of Wild Fauna and Flora (CITES) - collectively making up the 'International Consortium on Combating Wildlife Crime' - have launched a powerful new Public Service Announcement. The UNODC Global eLearning Programme launched a new Anti-Corruption course on its Learning Management System. This course consists of two eLearning modules - "Introduction to Anti-corruption" and "Advanced Anti-corruption: Prevention of Corruption". The modules have been designed by UNODC anti-corruption experts aiming to improve the learners' understanding of the provisions of the United Nations Convention against Corruption (UNCAC). Large scale criminal activity in the fisheries sector is rampant and highly lucrative. With these crimes frequently being of a transnational and largely organized nature, the sector is vulnerable to multiple issues including illegal fishing, corruption, document fraud, and human trafficking. UNODC together with WWF convened a meeting in Vienna to address fisheries crime through the criminal justice system, extending beyond the traditional realm of fisheries control.